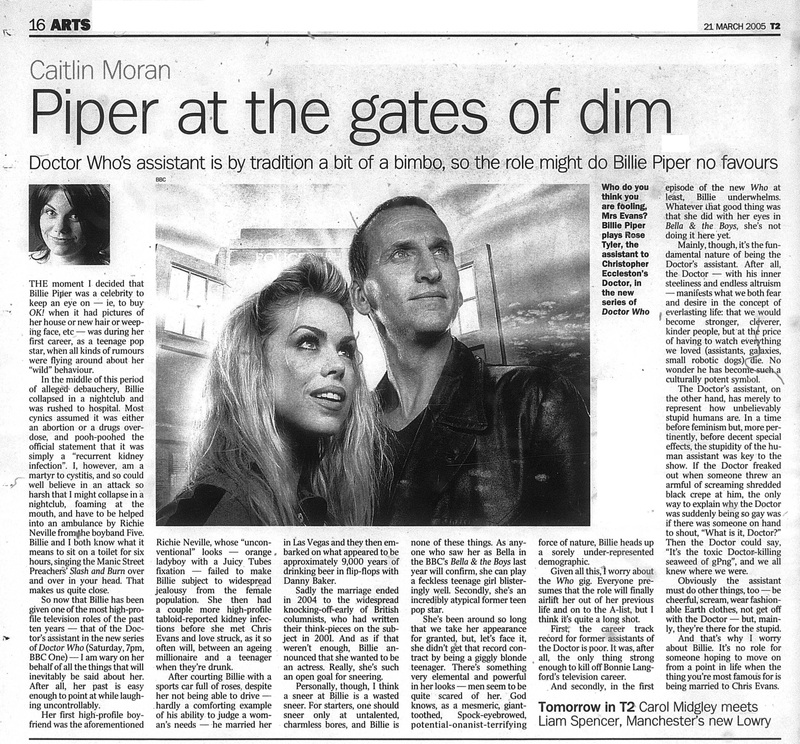 THE moment I decided that Billie Piper was a celebrity to keep an eye on — ie, to buy OK! when it had pictures of her house or new hair or weeping face, etc — was during her first career, as a teenage pop star, when all kinds of rumours were flying around about her "wild" behaviour. In the middle of this period of alleged debauchery, Billie collapsed in a nightclub and was rushed to hospital. Most cynics assumed it was either an abortion or a drugs overdose, and pooh-poohed the official statement that it was simply a "recurrent kidney infection". I, however, am a martyr to cystitis, and so could well believe in an attack so harsh that I might collapse in a nightclub, foaming at the mouth, and have to be helped into an ambulance by Richie Neville from4he boyband Five. Billie and I both know what it means to sit on a toilet for six hours, singing the Manic Street Preachers' Slash and Burn over and over in your head. That makes us quite close. So now that Billie has been given one of the most high-profile television roles of the past ten years — that of the Doctor's assistant in the new series of Doctor Who (Saturday, 7pm, BBC One) — I am wary on her behalf of all the things that will inevitably be said about her. After all, her past is easy enough to point at while laughing uncontrollably. Her first high-profile boyfriend was the aforementioned Richie Neville, whose "unconventional" looks — orange ladyboy with a Juicy Tubes fixation — failed to make Billie subject to widespread jealousy from the female population. She then had a couple more high-profile tabloid-reported kidney infections before she met Chris Evans and love struck, as it so often will, between an ageing millionaire and a teenager when they're drunk. After courting Billie with a sports car full of roses, despite her not being able to drive — hardly a comforting example of his ability to judge a woman's needs — he married her in Las Vegas and they then embarked on what appeared to be approximately 9,000 years of drinking beer in flip-flops with Danny Baker. Sadly the marriage ended in 2004 to the widespread knocking-off-early of British columnists, who had written their think-pieces on the subject in 2001. And as if that weren't enough, Billie announced that she wanted to be an actress. Really, she's such an open goal for sneering. Personally, though, I think a sneer at Billie is a wasted sneer. For starters, one should sneer only at untalented, charmless bores, and Billie is none of these things. As anyone who saw her as Bella in the BBC's Bella & the Boys last year will confirm, she can play a feckless teenage girl blisteringly well. Secondly, she's an incredibly atypical former teen pop star. She's been around so long that we take her appearance for granted, but, let's face it, she didn't get that record contract by being a giggly blonde teenager. There's something very elemental and powerful in her looks — men seem to be quite scared of her. God knows, as a mesmeric, giant-toothed, Spock-eyebrowed, potential-onanist-terrifying force of nature, Billie heads up a sorely under-represented demographic. Given all this, I worry about the Who gig. Everyone presumes that the role will finally airlift her out of her previous life and on to the A-list, but I think it's quite a long shot. First, the career track record for former assistants of the Doctor is poor. It was, after all, the only thing strong enough to kill off Bonnie Lang-ford's television career. And secondly, in the first episode of the new Who at least, Billie underwhelms. Whatever that good thing was that she did with her eyes in Bella & the Boys, she's not doing it here yet. Mainly, though, it's the fundamental nature of being the Doctor's assistant. After all, the Doctor — with his inner steeliness and endless altruism — manifests what we both fear and desire in the concept of everlasting life: that we would become stronger, cleverer, kinder people, but at the price of having to watch evething we loved (assistants, galaxies, small robotic dogs) die. No wonder he has become such a culturally potent symbol. The Doctor's assistant, on the other hand, has merely to represent how unbelievably stupid humans are. In a time before feminism but, more pertinently, before decent special effects, the stupidity of the human assistant was key to the show. If the Doctor freaked out when someone threw an armful of screaming shredded black crepe at him, the only way to explain why the Doctor was suddenly being so gay was if there was someone on hand to shout, "What is it, Doctor?" Then the Doctor could say, "It's the toxic Doctor-killing seaweed of gPng", and we all knew where we were. Obviously the assistant must do other things, too — be cheerful, scream, wear fashionable Earth clothes, not get off with the Doctor — but, mainly, they're there for the stupid. And that's why I worry about Billie. It's no role for someone hoping to move on from a point in life when the thing you're most famous for is being married to Chris Evans. APA 6th ed. : Moran, Caitlin (2005-03-21). Piper at the gates of dim. The Times p. Times2, p. 16. MLA 7th ed. : Moran, Caitlin. "Piper at the gates of dim." The Times [add city] 2005-03-21, Times2, p. 16. Print. Turabian: Moran, Caitlin. "Piper at the gates of dim." The Times, 2005-03-21, section, Times2, p. 16 edition. This page was last modified on 29 January 2017, at 00:05.